The five permanent members of the UN Security Council and Germany said Tuesday they are set to resume nuclear talks with Iran. The six-nation group was responding to a February letter from Iranian nuclear negotiator Saeed Jalili proposing a new round of discussions. 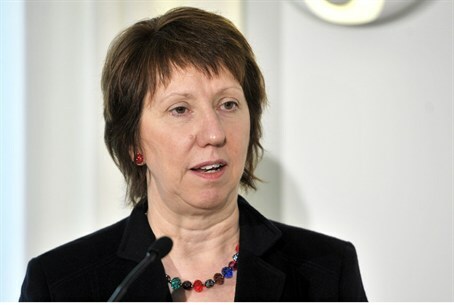 EU foreign policy chief Catherine Ashton, Jalili's primary contact, said the dialogue must deliver "real progress." The EU hopes that Iran "will now enter into a sustained process of constructive dialogue which will deliver real progress in resolving the international community's long-standing concerns on its nuclear program," Ashton's statement said. Ashton had written Jalili in October, offering Iran a new round of talks toward an agreement that "restores international confidence in the exclusively peaceful nature of Iran's nuclear program." Her announcement came as the semi-official ISNA news agency reported Iran said it would grant UN inspectors access to the Parchin military complex. International Atomic Energy Agency inspectors believe Parchin contains a test chamber for the high-explosives needed to detonate nuclear warheads. The time and venue of the talks have yet to be determined. Many leaders are skeptical of Iran's motives for resuming talks, saying Tehran is merely trying to buy time in its bid for nuclear weapons. Tehran had previously barred UN inspectors from visiting the Parchin installation, but a statement by Iran's permanent envoy to the IAEA said Tuesday the visit will now be allowed in a gesture of good will. However, it would require an agreement between the two sides on guidelines for the inspection, ISNA reported. Israel, the United States, its Western allies, and Gulf Arab states believe Iran is seeking nuclear weapons, and speculation is rife that Jerusalem may launch a pre-emptive strike to set back the program.